Anne was invited to the Perth, Albany and Adelaide Literary Festivals in February and March 2013. At Adelaide, the largest Free Festival in Australia, The Fishing Fleet topped the list of the ten Festival best-sellers. 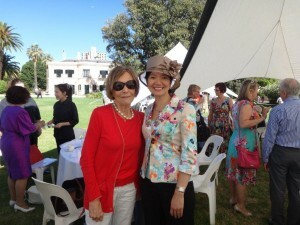 Anne was also the author picked to speak at the Booklovers’ Breakfast at Government House, Adelaide. The Fishing Fleet: Husband-hunting in the Raj was published on 12 July 2012 and jumped straight to no 1 in Amazon’s Mover and Shakers, to no 4 in the (non-fiction) best-sellers list, no 2 in the Telegraph Books list and no 1 in the Evening Standard best-sellers list.